I'm so excited about this new camera purchase! It is absolutely amazing! It was so random how it happened too. I was talking to Markie on aim and I asked him, "So, do you know any good SLR's?" Markie - "OMG, I was asking Ja the same thing today? About an SLR camera"
Me - "No way! So what did he say?" Markie - "I was checking out the Canon from Costco since it was on sale and wanted to know if it was a good deal for that camera. He said it was good." Me - "Oh really? That's cool, I've been wanting one for the longest time." Markie - "Check out this link, it's on sale at Dell. Let's both buy it right now. Greg is probably going to think 'WTH' tomorrow morning? haha"
Me - "Let's do it! hahaha"
Markie - "What color are you gonna get?" Me - "I'm not sure, maybe black? How about you?" Markie - "Then I'll get silver." Markie - "Let's both get black, the pros don't use silver." Me - "hahahaha...okay okay, good point. " Two days later, I had to get some accessories to protect it. Here are the latest purchases! 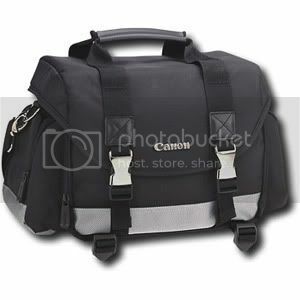 A camera bag and a CF card....lovin' it! !